Rob Muldoon was one of our most polarising PMs. To supporters he was the voice of ‘the ordinary bloke’; to critics he was a dictatorial bully. After wartime service, Muldoon became an accountant. He entered Parliament in 1960 and became minister of finance seven years later, acquiring the nickname ‘Piggy’. In 1974 he deposed Jack Marshall and launched his bid for power. Muldoon mastered television, wrote the bestseller The Rise and Fall of a Young Turk, and packed public meetings with ‘Rob’s Mob’, who included many blue collar conservatives. Helped by the promise of an expensive superannuation scheme, he crushed Labour in 1975. 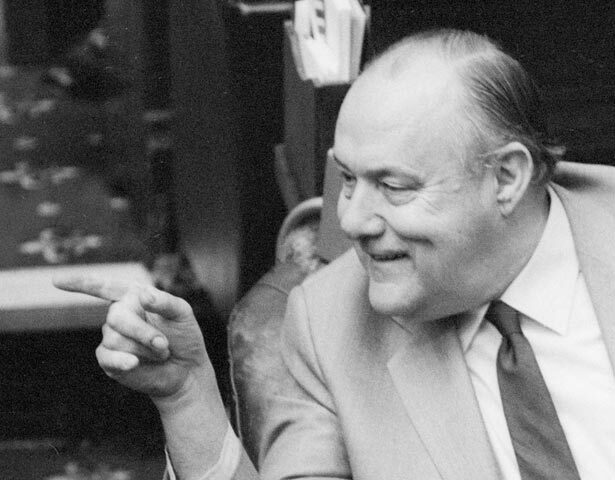 Muldoon’s premiership was dominated by the same economic challenges Labour had faced. He continued Labour’s borrowing and increased subsidies to farming and industry. His ‘Think Big’ heavy industry programme proved costly, though Closer Economic Relations with Australia worked. Muldoon was complex. He was liberal on some issues, and happy to drink with gang members, but he was opinionated and aggressive – ‘counterpunching’ he called it. His glare intimidated. That abrasiveness, and the divisive Springbok Tour of 1981, alienated urban liberals. The Tour also caused diplomatic difficulties. Eventually Muldoon accumulated too many enemies. In 1980 Cabinet almost dumped him. He narrowly won the 1981 election, but alienated younger MPs tired of his 'financial wizardry', especially his wage/price freeze. He was defeated in the 1984 Bastille Day snap election (sometimes called the ‘schnapps’ election, a reference to his drinking). Sir Robert, as he now was, ended his term with a currency and a constitutional crisis. After being deposed as leader, Muldoon sat on the back benches, increasingly dismayed by the free market policies of both major parties. He died a year after leaving Parliament. We have 2 events in history, 24 biographies, 4 articles, 1 comment related to Robert Muldoon. He hosted a weekly talkback show until the day he died. It was called "Lillies and Other Things". he was decimated when his beloved National Party under the leadership of Jim Bolger broke a string of promises.